Groups booking the six-hour Very Victorian Tour will travel back over 100 years to experience the sights, sounds and smells of a former era at Blists Hill Victorian Town. Lunch can be enjoyed at one of the cafés or groups can tuck into some traditional Fish ‘n Chips. 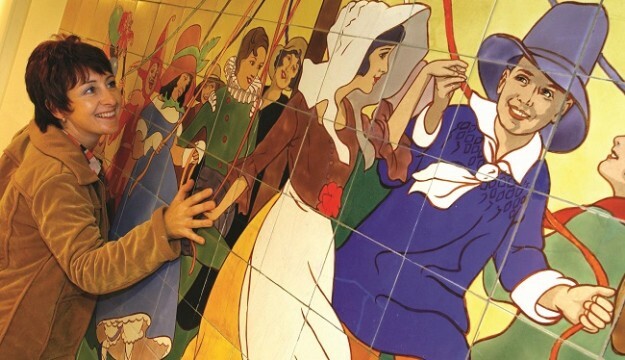 This tour also includes a visit to Jackfield Tile Museum where you can see magnificent tiles that decorated Victorian Britain. Final stop, walk across the world famous Iron Bridge and a peek into the charming Tollhouse. All Aboard! Enjoy two day trip offers with Ironbridge Museums and the Severn Valley Railway. New for 2018, discover Coalport China Museum and relax with a one-way trip on the Severn Valley Railway – all for just £20pp adults / seniors or £16 for children aged up to 16 years. Looking for something different? 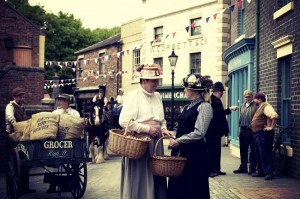 Groups can start the day with a nostalgic one-way journey on a steam-hauled train through the picturesque Worcestershire and Shropshire countryside, and then travel back over 100 years as your group spends the afternoon experiencing the Victorian age at Blists Hill Victorian Town – all for just £22pp adults / seniors or £16pp children. From 1st March until 31st October 2018 groups can spend the morning enjoying a relaxing cruise on the River Severn on board the Sabrina, Shrewsbury’s acclaimed passenger boat, with live commentary and tea/coffee with biscuits, and the afternoon exploring Blists Hill Victorian Town. This package is just £16pp but groups must book at least two weeks ahead and will need to use their own transport between the boat embarkation point and Blists Hill. Warm up your winter and get out and about for less with plenty of fun things to see and do at Ironbridge. New for 2018, groups can get admission to Blists Hill Victorian Town and a roast pork bap (vegetarian alternative available) for just £11pp, available in January – March and November 2018.For more great rates and offers see www.Ironbridge.org.uk. Soak up the Yuletide atmosphere and visit Blists Hill Victorian Town over the two Festive Weekends of 8 – 9 and 15 – 16 December 2018. Groups can take advantage of a very special rate – just £9.50 per person for parties of 15 or more. Enjoy seasonal entertainment and activities; watch as the townsfolk busily make preparations for Christmas, Victorian style, listen to brass bands, meet Father Christmas’ reindeer and enjoy delicious festive food and drink.